Left in the past are companies that are solely profit-driven. In their place are consumer-centric companies that are culture-driven. 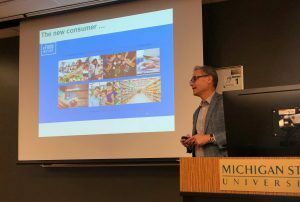 “Winning companies win with winning cultures” was the key message David M. Staples (BA Accounting ’85), president and CEO of SpartanNash Co., drove home to Eli Broad College of Business Full-Time MBA students in the most recent Pung Executive Speaker Series event of the fall semester. SpartanNash, a Grand Rapids-based food distributor and grocery store retailer that embodies the notion of “a legacy of service, a history of growth” started as solely a distribution company. Today, the Fortune 400 company, once known as Spartan Stores, is America’s fifth-largest grocery distributor and is among the leading grocers for the military. In order to successfully merge with a company as large as Nash Finch, Spartan Stores had to have a strong leadership presence. Key features of effective leadership are, “bringing a vision to the forefront of the company, laying out the path to get there, and demanding accountability from all members working towards the goal,” said Staples. When effective leadership is implemented, strong teamwork is a natural outgrowth. With each individual knowing the part they play within the team, the group can work cohesively to achieve the company’s goals. When Spartan Stores and Nash Finch merged, sitting before them were two different company cultures. Bringing together two companies that were previously competitors requires a cohesive and strategic mindset, Staples said. SpartanNash integrated and combined the two company cultures, and in turn developed company values that took on aspects of both companies prior to the merger to ensure the best features of both would be reflected in the merger. Through a multi-year integration plan, SpartanNash coalesced its vision and mission, Staples said. With its mission statement, “to leverage our expertise in food distribution and retail to develop, activate, and provide impactful solutions that exceed expectations for associates, customers, and partners,” SpartanNash has ingrained its core values into each employee of the company. Those values enable SpartanNash to be a best-in-class business that feels local, and where relationships matter. Today, SpartanNash is poised for growth. The company realigned its structure for success in order to be a national network that is efficient, with the ability to distribute anything to anywhere. The company also reworked itself from the inside-out, ensuring they were only hiring the highest-caliber talent and promoting high-potential associates, Staples said. In advancing workforce diversity, the company continues to ensure succession planning through developing future SpartanNash leaders. Staying true to its local roots, having started as a small Michigan company, SpartanNash embraces its corporate responsibility and advances its vision to “be a best-in-class company that feels local, where relationships matter,” through creating purpose beyond a paycheck, Staples said. The company puts its customers at the forefront through giving back to the local communities in which they live through various volunteer opportunities and financial support. New industry trends have emerged in recent years that have disrupted the way in which grocery stores must operate. It is no longer your “mom’s supermarket” anymore. In its place is the rise of online retail, the need to be transparent, and dealing with a distrust of larger corporations, Staples said. To keep up with the changing times, SpartanNash has implemented changes such as its click-and-collect program which enables consumers on-the-go to pick up their groceries in the parking lot of a store after ordering them online. Stores also offers unique experiences to customers such as having a cutting station where customers can have fruit and vegetables cut in store in their desired manner for anything from dinner that night, to fruit trays for a large event. It is this type of consumer-centric thinking that has allowed SpartanNash to be successful, and in turn, be poised for continual future growth.